AccuWeather Global Weather Center — April 12, 2018 — AccuWeather reports an outbreak of severe thunderstorms, including the potential for a few tornadoes, is anticipated from portions of the central and southern Plains to the Mississippi, Ohio and Tennessee valleys spanning Friday and Saturday. People spending time outdoors will only need to be vigilant for violent thunderstorms, but also the potential for flash flooding while driving and along small streams. The eruption of thunderstorms will be inspired by a strong temperature contrast, fueled by daytime heating and a surge of Gulf of Mexico moisture and enhanced by strong winds and dry air aloft. The same storm bringing the ingredients for severe weather together will also produce heavy snow and blizzard conditions in part of the north-central United States and an extreme fire danger farther to the southwest. More than 22 million people will be at risk for severe weather on Friday and Friday night alone. This day, the potential for damaging weather conditions will extend from near the borders of Nebraska, Iowa, Missouri and Kansas, southward to central Texas and eastward to the western portions of Illinois, Tennessee and Mississippi. During Friday, major cities at risk for violent storms and potential damage include Kansas City and Springfield, Missouri; Fort Smith and Texarkana, Arkansas; Tulsa, Oklahoma, and Dallas, Austin and San Antonio, Texas. The threat may extend as far north as Omaha, Nebraska, for a time. 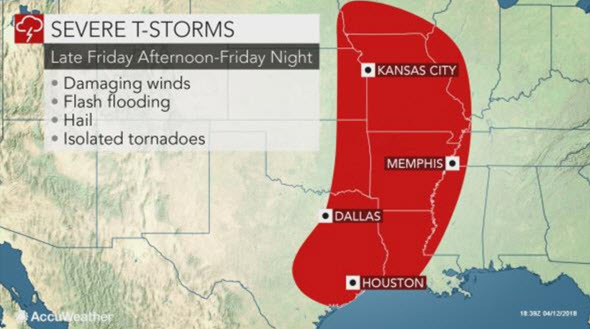 The storms will pick up forward speed on Friday night as the roll through Springfield, Illinois; St. Louis; Little Rock, Arkansas; Memphis, Tennessee; Shreveport and Alexandria, Louisiana; and Houston. The storms may bring the full spectrum of severe weather ranging from high winds, large hail, flash flooding, frequent lightning strikes and perhaps a tornado. On Saturday, the severe weather setup is likely to be complex in that clouds and rain from Friday night’s thunderstorms may race eastward and limit severe weather in parts of the Midwest and South. The greatest risk for violent storms on Saturday and Saturday night will extend from western and middle Tennessee to southeastern Louisiana and the panhandles of Mississippi, Alabama and Florida. A severe thunderstorm and flooding rainfall are possible in Nashville, Tennessee; Jackson, Tupelo and Biloxi, Mississippi; Huntsville, Birmingham, Montgomery and Mobile, Alabama; New Orleans and Pensacola, Florida, spanning Saturday to Saturday night. Farther north the risk of violent thunderstorms will be lower, but storms are likely to bring torrential rainfall and locally gusty winds in portions of Kentucky, Indiana, southeastern Illinois and southwestern Ohio. The risk of heavy, gusty and locally severe thunderstorms is likely to continue farther to the east on Sunday. Flooding downpours and gusty storms may affect the major airport hubs of Pittsburgh, Atlanta and Charlotte, North Carolina, to close out the weekend. A sweep of much cooler air will end the severe weather threat from west to east spanning Saturday to Monday. Persistent well below-average temperatures has been a factor in lower-than-average tornadoes so far this year. For example, in areas from Oklahoma City to St. Louis and Little Rock, temperatures have averaged 10 to 14 degrees below normal for April thus far. These areas lie within the heart of Tornado Alley. As of April 10, based on preliminary reports, there have been 47 tornadoes this month, compared to a recent three-year average of 174 confirmed tornadoes, according to the National Oceanic and Atmospheric Administration. The actual number of tornadoes through April 10 this year is likely to be less, once research has been completed. During April 2017, when temperatures averaged above normal over much of the region, there were 211 confirmed tornadoes across the nation. AccuWeather Storm Warning Meteorologists are estimating that between two and four dozen tornadoes may be reported with this multiple-day event. Most of the storms capable of producing tornadoes are likely to be from late Friday afternoon to Friday evening, with perhaps another pulse on Saturday afternoon and evening.